We are nearing the end! 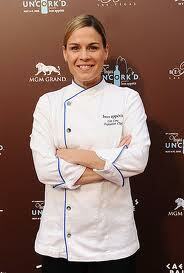 This week Cat Cora, #48 on Gourmets list of the 50 Most Influential Women in Food, takes center stage! She is the first female Iron Chef! Cat was born in 1968 to Greek parents in Jackson Mississippi, where she was raised in a Greek community, that had a profound influence on her life. Her father and grandfather were both restauranteurs. Eating and food were the centers of her environment. At 15, she drew up a business plan for her own restaurant. After earning a BS degree in Exercise Physiology and Biology from the University of Southern Mississippi, she enrolled in the Culinary Institute of America in Hyde Park, NY. honor from Bon Appetit when they named her Executive Chef of their magazine. Cat has written three cookbooks. Her first, Cat Cora’s Kitchen, was inspired by her Greek and Southern heritage. She has also written Cooking From The Hip: Fast, Easy, Phenomenal Meals and, Classics with a Twist: Fresh Takes on Favorite Dishes. Cat has also been a fixture at the Food Network, appearing on many of their shows. Ms. Cora has several high profile restaurants including Kouzzina at Disneyworld, CCQ in Costa Mesa California, and Cat Cora’s Kitchen at the Houston and San Francisco Airports. She is also known for her philanthropy. She is the founder of Chefs for Humanity, a not-for-profit, that brings the culinary community together to raise funds and provide resources for emergencies and educational and hunger-related causes. In June of 2010, she partnered with Michelle Obama as part of her Chefs Move to Schools campaign. A program that teaches kids about nutrition. Cat resides in Santa Barbara California, with her partner Jennifer, and their four sons. I chose Pastitsio Kima…Baked Macaroni to represent Cat. This is a Greek or Mediterranean dish. I found Cat’s recipe to be a bit unclear about how to put it together. I made it as written but, found that it made a huge amount of white cheese sauce. I only used about half of what I made, and I could not have gotten another drop into the baking dish. Directions were not clear on how to layer this either. I made two layers so I didn’t get a distinct sauce and cheese layer. I also think it could have used more red sauce. I think this dish lacked flavor. I blame myself for that. I couldn’t find the Kassiri cheese so I substituted a mozzarella and provolone mix. I think the Kassiri would have added another layer of flavor that mine lacked. One thing I found quite funny was that Pastitsio (pa-STEE-tsee-oh) loosely translates to mess or hodgepodge in Greek. Messy pretty much described my kitchen when I was finished with this dish. All and all it was pretty good…just not great! Brown beef in a pan. Add onions and garlic and cook until soft. Deglaze with the red wine and reduce to 2 tablespoons. In a small bowl, mix together tomato puree and crushed tomatoes to make a sauce. Add to the onions and garlic, and then add the water. Season with salt, pepper, cinnamon, and nutmeg. Simmer for 10 minutes. Cook macaroni in salted water: drain. Return to pan. Add butter, egg whites and 1/2 cup of cheese, mix well. Heat up milk on medium high until it comes to a simmer. In a separate pan, melt the butter. Whisk in the flour until well blended. Whisk in warm milk. Bring mixture to a simmer and cook until fairly thick. Season with salt and nutmeg, to taste. Temper in the egg yolks. Add 1 cup of cheese. In a buttered 13 by 9-inch baking dish layer macaroni mixture and meat sauce, cover with white sauce and sprinkle with remaining grated cheese on top. Bake in a preheated 350 degree oven for 45 minutes. Remove from the oven to rack and let stand for 15 minutes. Cut into squares. I love this dish. Guess you'll have to make some more to use up all the white sauce? Lovingly looking at this. It sure looks delicious to me Kathy! I would never think to combine red sauce and the white sauce. I suppose I should give it a try since I'm not much of a pasta fan (don't tell anyone:) and I sure am tempted by this dish! Kathy, the Baked Macaroni looks yummy:) It is frustrating to me when recipes are not well written. However, you did a great job in making this dish:) Have a great weekend! I've never had pastitsio but it looks very tasty. I do love lasagna with both red and white sauce so I'm sure this is great! Kathy, one thing is for sure - after all this baking with all that butter and all the sweets things we made this week, I would greatly appreciate a plate of that delicious looking Baked Macaroni - even if you were not overly enthusiatic about it, it still looks delicious to me! Baked pasta is always delicious. Can't wait to try this recipe. This looks wonderful. I love pastitsio, and don't worry. There aren't real layers to this dish. In fact, most recipes I've seen mix the pasta and meat sauce together before pouring the white sauce on top. And none have a lot of red sauce to them. I'm not sure why it would be bland. The flavors look right to me, even with your cheese substitutions. Guess I'll have to try it for myself because it looks delicious! Pasta is the name of the game! This is added to the make list. Sorry your dish wasn't what you hoped...guess we both we a bit disappointed this week, Kathy. I do like the idea of the uncut macaroni, though. It looks delicious, but I am sorry it wasn't a great dish. It is so frustrating when the recipe directions aren't very clear. Kathy, I have enjoyed reading your Posts during this project and will be sorry to see it come to an end. I printed out the list and am going to explore the cookbooks on my own. 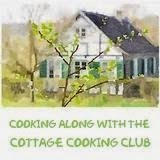 I will be referring to your Blog to see the recipes you used and your comments. So, thank you. Kathy, my heart is breaking for you as I read this. I hate when I make a huge mess in the kitchen creating a dish I don't love! It does look delicious though, thanks, in large part, to your excellent photography. I give you a lot of credit for trying this traditional Greek dish - it sounds quite involved, and although you might have gotten the results you wanted, it still looks fabulous.